The story continues – inspiring thousands – to aim and dream big. If you missed the first two parts of the UPSC topper interview, you can read them in the following hyperlinks : UPSC Topper, Lipin Raj M. P’s (CSE 2012 Rank 224) Interview – Part 1 and UPSC Topper, Lipin Raj M. P’s (CSE 2012 Rank 224) Interview – Part 2. Having already shared his UPSC interview experience and study plans, Lipin discusses his success mantras in this post. ClearIAS.com: What do you think as the main reason for your success? I believe that more than anything else it was God’s grace which is responsible for my success. It enabled me to take the right decisions at the right time. That was a crucial thing. For any success to occur decision making ability should be spot on. I opted IAS , IIS and IFS as my first three priorities. In state preferences I put all 7 North-eastern states apart from my home state Kerala. Before starting the preparation I heard about IAS and IIS. As I am interested in both administration and creative contribution, I thought that both services would be suitable for me for a long term career. IPS was my initial passion when I saw some film stars and people of IPS and their inspiring stories. Even though my rank was surely eligible for IPS, my physical disability did not give me any option to join there. As I am a graduate in Mass communication and Journalism and had some work experience with newspapers and channels I believe that the Indian Information service would be a better service for me. It depends on individual priorities. So after my success I started to share my preparation strategies and tried to motivate aspirants on how to mould their success path in future. I thought that I never got any type of exposure except from some teachers saying that ‘Lipin, you should write IAS’ ( They thought that Civil services means IAS only !!! ) so this should not happen to my young brothers and sisters. I could hardly find some good libraries during my preparation and because of that I started to implement a scheme for ‘Civil services lending library for aspirants’ from my personal collection. Thus after the results, I wanted to interact with public on my previous ideas of good governance, wanted to inspire youth and to nurture dreams of fool-proof administrative skills in the minds of children; a childhood dream of mine. In my personal view, Whenever you achieve something ,your particular mission ends, but at the same time another mission awaits you, and you are prepare for another battle again. If hundreds of people from low-strata of society can do this why can’t you. They already proved with their sheer determination that these services are not reserved for people who are born in elitist families or only to heavenly-born children. Educational exposure may be of concern for you in initial years, but later it will not matter, because of the outreach of internet, options of guidance and coaching exposure. For example, I used to limit my expenses with Rs.250 per month that was getting from some competitions like elocution or story writing. During my college days in Trivandrum I worked in a local newspaper where I will get Rs.650 and has to manage with all my monthly college expenses. After my degree my worked in a local news channel and managed to handle expenses with Rs.1500 which was one of the toughest times in my life. After graduation I joined in State bank of Travancore and earned Rs.9793 in a slightly better position. I started to subscribe English competitive magazines and English newspapers. In IDBI bank I earned Rs.21765. From this , 75% I spent exclusively on books. From my first salary I bought a laptop which drastically changed my preparation tools. However, when it comes to finances, the picture is slightly different. Here the practicalities of life come to the fore. When prospective candidates come to a place like Chennai or Delhi coaching fees, food and lodging is an issue of immediate concern, as these things are expensive in big cities. If one doesn’t have access to good lodging and decent food, it becomes very difficult for the candidate to focus entirely on studies, as chances for part-time job is less as well as it would eat your time. And finally if you are mentally prepared for a fight in this battleground of preparation, the earth will start to support you automatically by sending good people, circumstances, materials etc. From this technique, I understood that there is an existence of God, which you can’t see, but you can feel. Update from ClearIAS.com : Success of Lipin, in-spite of the struggles he faced was highlighted by many print and electronic media. Sharing a few links of the same. 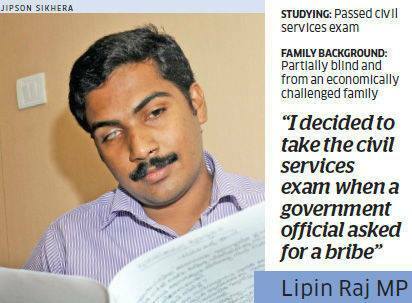 The Hindu on Lipin Raj M P.
India Today on Lipin Raj M P.
Economic Times on Lipin Raj M P.
Once I met a person (who had failed in his first 2 UPSC chances) in a library premises where I am a regular visitor. I conveyed my wish to become civil servant he asked about my background. “Currently I am having job. So how can I arrange my strategy?” I again asked. “From where do you hail?” finally he asked. He said to my friend that he met me and tried to divert me from preparation. Why did he try to do that? Then only it will reduce his competition. Nowadays he is telling everyone not to prepare for civil services!! In 2012 CSE , visually disabled category cut off was higher than general cut off and I got 56 marks than the general category candidate !!! Some people will not change their mind-set in one lifetime. I am not a person to preach great ideologies or motivational speech to those people who failed in their previous attempts. Even I decided to quit this exam when I failed in first attempt. Later when I analysed my approach to preparation strategy I realized that I am nowhere and not even can compete with those who studied in Delhi coaching institutes. Once I completed first level of preparation and got a command over the exam, then realized and blamed myself for my foolishness that I did in my first attempt. I understood later that unfortunately I never met a person who wrote civil services before. Before the result the only person I saw who wrote civil service examination was my district collector and I always saw him from a distance of 10 feet with due respect while going for public functions. I know how much pressure, tension and expectations is faced by those who truly prepare for this exam. But my suggestion is analyse your previous strategy, re-structure it if you really feel like that or continue with your current strategy once you are quite confident about that. And don’t give up the attempts. At least complete all your chances and and only if you don’t land up in the final list, think about settling into other jobs (for which this preparation should always help you). Civil services mean 24 services (Group A and Group B), apart from the three All India services- IAS, IPS and IFS. Even though you get a less rank you will land somewhere and you can always prepare again. However, one must also keep the fact in mind that civil services are not the be all and end all of life. If one doesn’t get through it that clearly means that one’s destiny lies elsewhere. We can equally contribute to society while serving in other jobs as well. Civil services should be the means, of serving people and society, and not an end in itself. Apart from this every candidate who is preparing for the exam must keep in mind some alternative career option as well. A backup in hand will not only be a more pragmatic step but also generally boost the confidence level of the candidate who is preparing. I believe that every action should have some sort of creativity. It’s like a chocolate pastry in an ice cream. Try to evolve a life with creative thoughts and out of box ideas apart from rules and office procedure manuals, which are necessary to run the bureaucracy in a systematic manner. Please don’t expect big cars with 120 km/hr speed and red lights, a big bank balance (obviously no bribes) or servants or clerks who are like your slaves, and ac rooms. Don’t think that here you are having absolute powers and control over society. If you are sincere and duty bound to running the system; automatically all this things will come to you. Government services, especially group A services, are one of the most challenging jobs for the next 3 decades. So never compare these services with any other private sector companies. But really, you can do as big things as your private sector counterparts. ClearIAS.com: We like to express our heartiest congratulations once again for your spectacular success in-spite of hardships. We hope to see you as a model for all aspirants who wish to defy the word impossible. We sincerely thank you, on behalf our readers and ourselves, for the kindness showed to find time to write answers for our detailed questionnaire. Wishing you, all the very best in career and life.